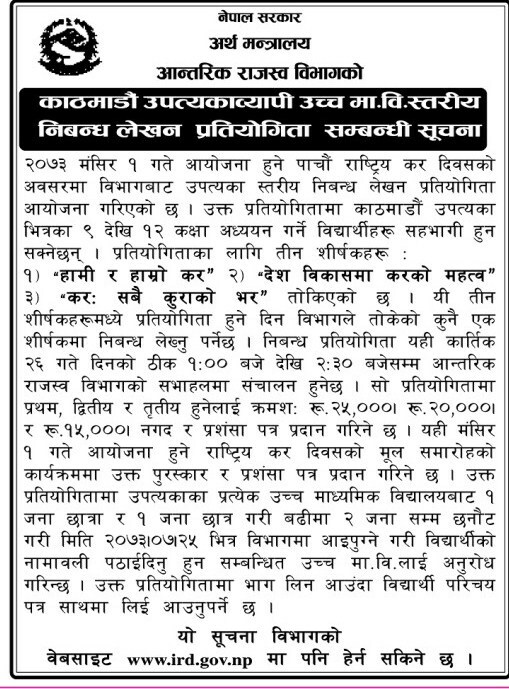 Government of Nepal, Ministry of Finanace, Inland revenue department is organizing "Valley-Wide Inter Higher Secondary School Essay Writing Competiton". Students studying in grade 9-12 in Kathmandu valley are eligible to take part in this competition. Students have to write Essay in one of the three given topics (see notice below). The essay competiton will be held in Kartik 26, from 1 to 2:30 pm in the meeting hall of Inland Revenue Department. Third: Rs. 15,000 and medals/certificates. For more information, see the notice below.